"'We think we are so individual and so misunderstood when we are young; but the nature our strain of blood carries is inside there, waiting, like our skeleton.'" First serialized in McCall's from May to October, 1926. Published by Alfred A. Knopf on October 20, 1926. Published by William Heinemann in April 1928. Published by Houghton Mifflin Co. in 1938 in a volume with Lucy Gayheart. 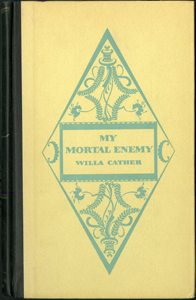 Unmasking Willa Cather's "Mortal Enemy"